Reflecting on forgiveness can bring up our most painful wounds as well as the people who come with them. This can make most of us say forget about forgiveness instead of forgiving and forgetting the past. Rather than passing on embodying the great gifts that forgiveness has to offer, how about noticing the everyday opportunities you receive to exercise forgiveness? Such as not holding a grudge against the person who missed your appointment with them, being OK with the invitation to the party you didn't receive or understanding the person who always interrupts and just doesn't know better. Perhaps you can dig a little deeper inward and notice if you were in the wrong and need to forgive yourself. When you truly let go of the inner and outer critical dialogue, have compassion and forgive another including yourself, you set yourself free. Also forgiving another doesn't make you a push over. You can craft it into a pathway to move forward with improved communication, clearer boundaries or the sentiment that it was nice knowing you, goodbye and good luck! If you make forgiveness a practice you will soon understand that the person who benefits most from forgiveness is you. With this profound realization you just might find you will have the motivation to work on forgiving and forgetting your deepest wounds. Tuesday August 2nd the Rev. JP Dada Vaswani celebrates his 98th birthday. He like last year and the years before requests that on his birthday Aug. 2nd at 2pm no matter what time zone you're in to take a few moments to become still, get quiet and reflect on forgiveness. This international meditation is called "A Moment of Calm." Imagine the positive wave of peace this inner work can do. Please join us this coming Tuesday at 2pm for a Moment of Calm. Nature does not recognize the injustice that's found within the world. It certainly can be affected by it such as in pollution, forests being destroyed and so on however it doesn't engage in what humans do to it and of course what we do to each other. With the world news being so overwhelming, it's hard not to notice the fear that has been generated within my thoughts and the community I live in. Spend so time outside. Perhaps you can go to a favorite spot or sit on the nearest park bench. Quietly sit, stand or practice yoga postures while allowing nature to be alive and moving around you like a friend. Release your global and internal concerns and notice what you hear, see, smell and feel. Perhaps the warm summer wind, the vast sky above or the morning dew on the grass. Realize the part of your consciousness that is eternal. The part of you that embodies the enduring elements of nature. Such as your internal fire that's found within your belly that relates to the sun's strength. Your reliable breath like the air we breathe. Your limitless potential which is like the upper regions of air that's beyond the clouds. Emotions that rise and fall like the tidal quality of water and a sense of home that's found within your heart as your grounding and earthly connection. Meditating in nature and connecting with it as a living being can help you reach this eternal state. A state of realizing that you too like nature have limitless qualities which are not helpless when things fall apart. This is not a one time meditation yet one you can practice over and over for about twenty minutes. This coming September I will be leading a 6 week long Kid's Yoga program with my mini, Krishna. 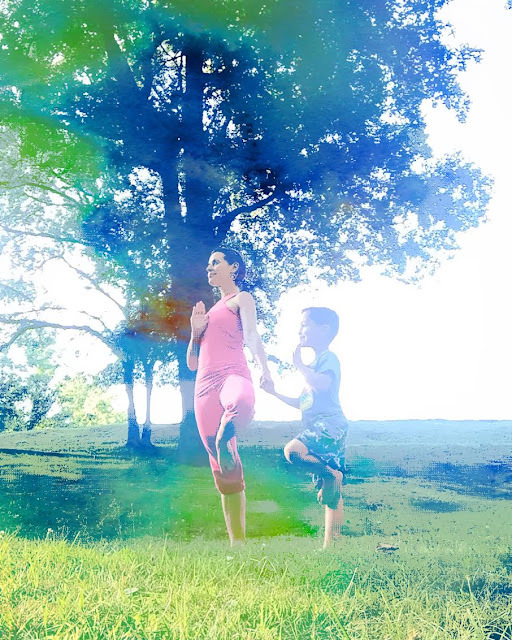 Kid's Yoga introduces children ages 5-8 to a fun yoga practice that is non competitive, physically inspiring as well as peaceful and calming. It is never too soon to start your yoga practice. Please vist www.bamboomovesenglewood.com to register for this special program.